Lincoln County Men at BKM link. 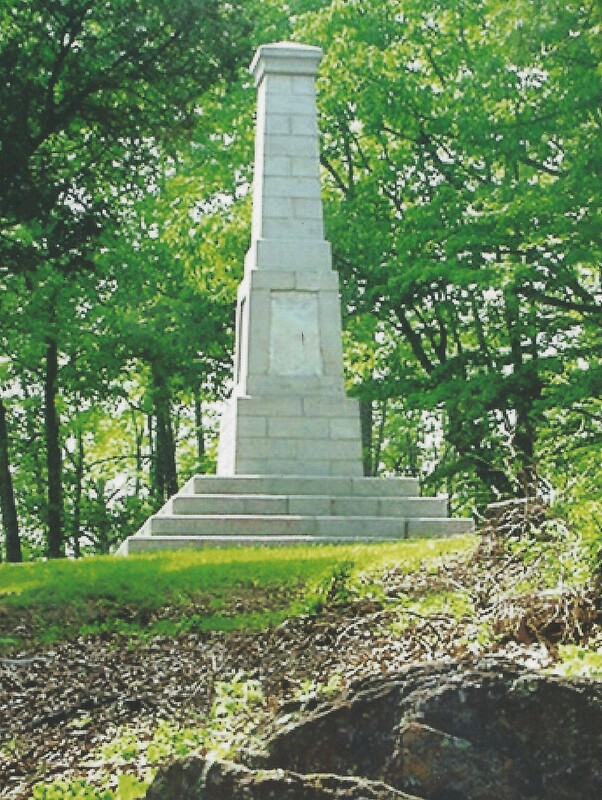 The 1880 centennial monument was the second at Kings Mountain. The 1909 obelisk was erected by York SC DAR with assistance from remnants of the centennial committee, US Corps of Engineers, and some taxpayer OPM. The old NPS visitor center (now the park HQ building) contained an indoor exhibit and a collection of historical articles. The new visitor center contains interpretive displays and a theater to show historic productions. Much of this web site focuses on the bronze plaque on the east face of the 1909 obelisk. Its subject is patriot casualties and its accuracy is less than 50%. This menu shows the west face plaque from the opposite side of the obelisk. Do you remember when there were no misteaks on the 1909 Kings Mountain monument plaque? 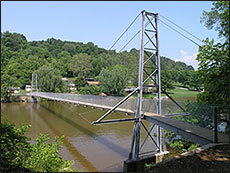 This picture shows it under construction. This web site can remain under construction for continuing refinement. You may volunteer to help. The Kings Mountain National Military Park contains a miniature Washington Monument style obelisk. It was begun at the urging of D.A.R. 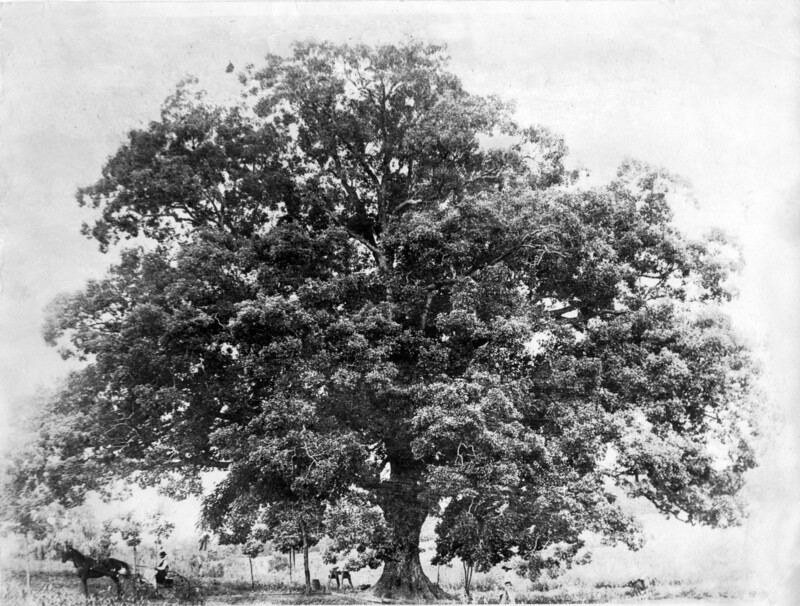 in York South Carolina in 1906. Teddy Roosevelt’s War Department had not yet paid off the loans which financed his charge at San Juan Hill in the Spanish American War. Congress appropriated $30,000. Roosevelt approved. We know something, maybe just a little clue, perhaps a complete biography, about 117 patriots killed or wounded on 07Oct1780. 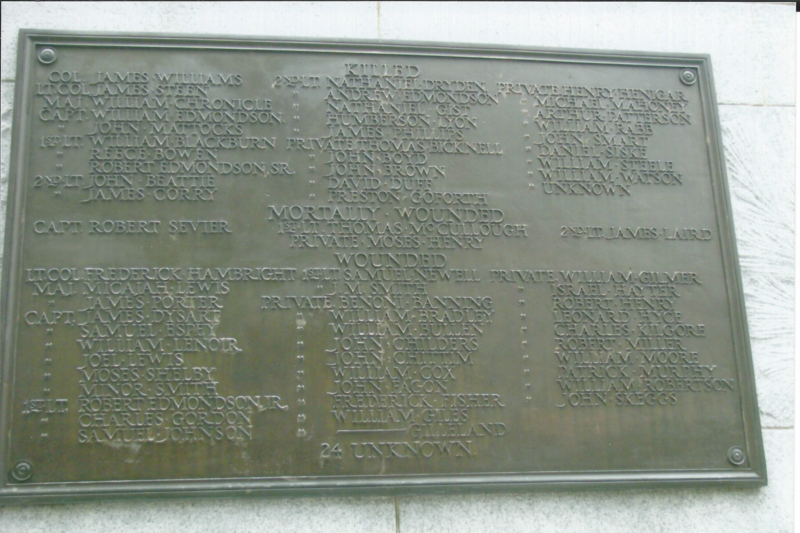 The 1909 monument lists 28 killed, 4 mortally wounded, and 34 wounded, 66 names. Six of those named events did not happen; killed people who lived on, people who were not there, and one name which was not a person. Six are shown at the wrong rank. Though some commissioned ensigns and non-commissioned sergeants were wounded in the battle, none of the sergeants or ensigns is shown. Please use the “contact us” tab to add or correct information in any of the 120 entries at the Personal plaques link. Most of the sixty odd entries on the plaque were actually present at the battle and actually suffered the wounds from Ferguson’s forces. The entries name perhaps half of the known casualties. Others were named in their own sworn testimony or that of their comrades as preserved in the War Department archives of pension declarations. Constructed of white granite from the Mount Airy quarry in North Carolina, the U.S. Monument towers 83 feet high above Battleground Ridge and rests on a two-stepped marble base (16’ x 3” squared). The interior of the obelisk is hollow, and the white marble bricks are contrasted against dark mortar. The diagonals of the obelisk roughly correspond to the four cardinals of the compass. And on each side of the monument are bronze tablets that dedicate the monument to the patriot victory at Kings Mountain, discuss the significance of the battle, list the American and British commanders, and list the patriot casualties of the battle. Bas-relief, or low-relief, sculpture flanks each of the tablets. On the north and south sides of the obelisk are sculptures of two seated women in profile wearing flowing Greco-Roman dress. The figure on the right grasps a sword and a laurel wreath, symbols of martyrdom and victory. On the left, the female figure holds a palm frond, a symbol of peace, in her right hand while her left rests on her shoulder, exposing her breast. The east and west sides of the monument portray sprigs of pine, representing immortality. Refrain from calling us hillbillies. Henceforth refer to us as Blue Grass Americans. Find a polished Blue Grass American voice with good equipment to remake the audio. 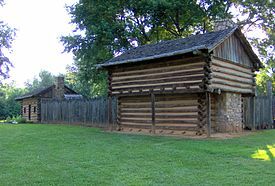 Thomas Jefferson said that the Battle of Kings Mountain 07Oct1780 turned the tide of the war. 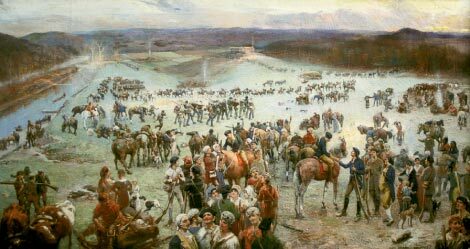 Historians have described the conditions leading to the battle, the gory events of the afternoon, the people in the battle, and what they did after that day. The facts vary from point of view, from mistake, from intentional deceit, from exaggeration, and from cloudy minds after the passage of time. Details might be omitted as inconsequential to various accounts. The most trivial detail could be important to the descendants or students of the most obscure soldier. As the body of knowledge becomes more complete and more solidified, newer accounts become more accurate. A courthouse burned a collection of records from its county, but pieces from the people, from other counties, from state records, and from national archives allow a view of part of the puzzle from that county. New information builds on Doctor Bobby Moss’ fine compilation of battle rosters. 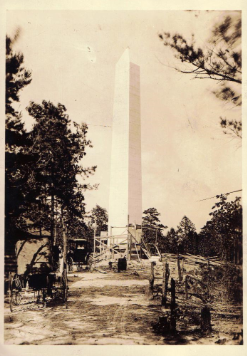 The 1909 Kings Mountain obelisk has a plaque to honor casualties turning from shining bronze to red faced shameful from its omissions and errors. This project is to build a virtual bronze plaque on the internet which presents true descriptions of the patriots of the Battle of Kings Mountain. Changes between the 1909 and the 1880 inscriptions are italicized.